Many home growers set aside a special area of the yard for cultivating tomatoes, which seem to taste exceedingly better than bland, store-bought tomatoes. No matter how many tomato plants you have in your garden, you most likely do not need them all at once. Properly storing tomatoes until needed will mean the difference between bruised and rotted tomatoes, or tomatoes that retain their wonderful flavor for a longer period. Wash your hands thoroughly to eliminate the threat of contamination. Dry using a lint-free cloth. Hold each tomato under cool running water. Use the running water to wash away any debris or soil left on the tomatoes. If you used pesticides and spray fertilizers on the tomato fruit as they grew, give the tomatoes a bath. Mix 1/2 cup of white vinegar and 3 tbsp. of salt in a large bowl of water. Stir with a wooden spoon until the salt completely dissolves. Soak the tomatoes in the vinegar solution for 20 minutes. Remove all of the tomatoes from their bath and pat dry with a lint-free cloth. Never squeeze the tomatoes, which bruise easily, and always handle them carefully. Set tomatoes that are under ripe in a brown paper lunch bag. Under-ripe tomatoes are still green or yellow-green. Close the paper bag by folding the top down. 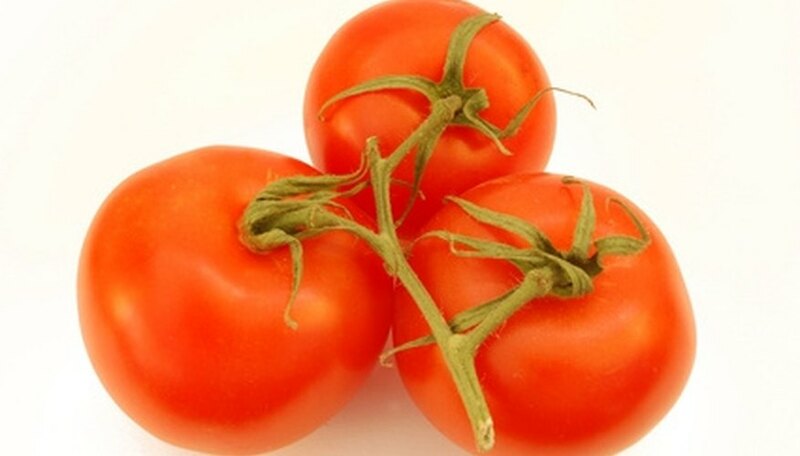 Tomatoes along with other fruits and vegetables give off a gas called ethylene. Placing the unripe tomatoes in a closed paper bag will accelerate this gas and cause faster ripening. Store ripe homegrown tomatoes on the counter away from any direct sunlight or in a bowl big enough to hold the entire bunch. Place the tomatoes with the stem side facing up. The stem side is the end of the tomato where it was attached to the plant stem. Placing the tomatoes in this position will reduce any darkening spots and softening, since this is the most fragile part of the tomato fruit. Tomates stored at room temperature should stay good for up to five days. Place tomatoes in a well-ventilated paper bag. Set the bag in the refrigerator for up to three days to delay tomatoes from over ripening until you need them. According to the Division of Agriculture and Natural Resources at the University of California, refrigerating tomatoes is not recommended for longer than three days due to the potential for excessive flavor loss.